COCOZIA - Sounds like a kind of crazy drink, and it is! But, check out these not so crazy facts… HYDRATION - Pure and simple, hydration is essential to life. COCOZIA Coconut Water is exactly that: A pure, natural hydration source containing not only water from the green coconut, but essential electrolytes too. ELECTROLYTES - COCOZIA contains a natural abundance of potassium and magnesium, as well as other electrolytes. Electrolytes are directly involved with body hydration and muscle function. Better to get yours from a natural source like COCOZIA than from a sugary, synthetic sports drink alternative. COCONUT WITH A STRAW - That's how they drink coconut water in the islands, but fortunately, COCOZIA has made it a little easier for you here! All the natural elements and flavor, without the need to carry a coconut to your work-out! My family is already a big fan of Cozozia coconut water since it's naturally gluten free, rich in magnesium, potassium and other electrolytes, and we just love the flavor. In my opinion, nothing else feels quite as hydrating when I drink it. I also particularly liked the fact that Cocozia is Certified Organic, Kosher, contains no GMO's or preservatives. Being a company that is Fair Trade Licensed is very nice too. The chocolate flavor is completely different but in a good way. It has a dark, rich chocolate taste to it and is a bit creamier than regular coconut water. The only "bad" thing I have to say, is the chunks that didn't seem to completely dissolve upon shaking. They don't taste bad, it was just an odd lumpy texture as you get to the bottom of the container. My initial thought was coconut chunks. My seven year old LOVED it! She said it reminded her of chocolate milk. If you're looking for a healthy treat to fulfill your chocolate cravings this is a perfect guilt-free way to do so! You can also try Cocozia in Coffee, Mango, and Pineapple. DISCLAIMER: All products received are complimentary for testing purposes from COCOZIA . All opinions stated are my own and are not influenced by any affiliates. This sounds delicious. I love coconut and chocolate, so I'm all about trying this. I was given some chocolate coconut water (a different brand) and it was horrible. We didn't care for it at all. It was overly sweet, way too watery, and looked like muddy water. I would totally try this. I think it sounds awesome. I mean, who doesn't love chocolate? I'm not normally a huge fan of coconut water. However, I'm willing to try anything with chocoalte. Chocolate coconut water sounds really nice! I wonder if this could be worked into any of my recipes. I have never heard of chocolate coconut water. The only ones I have ever seen is fruity flavors. This products sounds very yummy. I will have to see if this product is in stores near me. I've been wanting to try cocount water. Thank you for sharing this with us! I've had regular coconut water and it's very good on it's own. This sounds absolutely delicious and seems like a great way to get a quick chocolate fix. Omg I never knew you can get chocolate coconut water!!! My daughter loves coconut water and is chocolate obsessed so she will love this! I don't like coconut water but, this sounds delicious. I might have to try it, because I love Chocolate. I love coconut water and chocolate each independently, but I'm not sure how I would like them together. I'm an adventure eater (and drinker) though, so I'd really like to give it a try. It sounds very interesting! 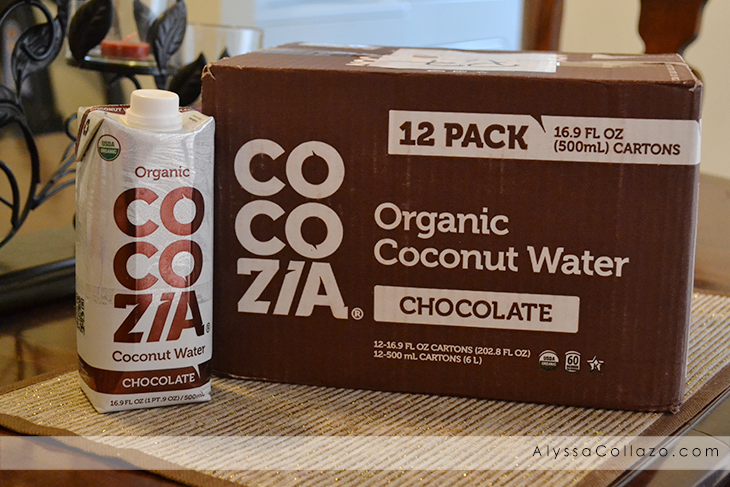 I'm not a huge fan of coconut water, but with chocolate added to it, I may give it a try. I'll have to check it out. I love coconut water but it's the first I've seen a chocolate flavored one. I hope I can find this here. Never tried chocolate coconut water before. Looks yummy! I have not tried a flavored coconut water before. I like regular coconut water so I have to try it.